A hearing on the Sink Creek Interceptor Line through Spring Lake Preserve will take place during the City Council meeting on June 21. The hearing will address Chapter 26 of the Texas Parks and Wildlife code. As some of you may remember, phase 1 of the Sink Creek Interceptor Line was installed along Lime Kiln Road. The project was riddled with problems. Now, plans for phase 2 of the project call for a wastewater line along Sink Creek and through a section of the western part of Spring Lake Preserve. SMGA does not support this proposed path. 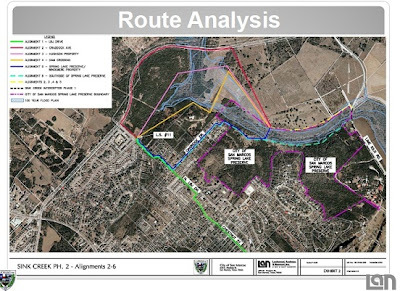 SMGA works to protect San Marcos’ natural areas, and we feel that running a wastewater line along Sink Creek and through Spring Lake Preserve poses a significant risk to this sensitive area (see route 5 on the map in this PDF; scroll down to page 5). Furthermore, proposed testing of the wastewater line only once every 5 years is too infrequent to discover potential leaks that could contaminate the San Marcos Springs and River, endangered species habitat, and water recharge land. While we appreciate that city engineers are aware of the errors in phase 1 of the project and plan to take extra precautions for phase 2, the reality is that everything breaks. Chapter 26 of the TPWD code requires a municipality to determine whether or not there is a “feasible and prudent alternative to the use and taking of such land“. Is a route through Spring Lake Preserve the only feasible and prudent route? We urge the city to find one that will avoid damaging a sensitive natural area that the people of San Marcos voted to conserve. What can you do? Email the city council and mayor at [email protected] as soon as possible and let them know that you do not support phase 2 of the Sink Creek Interceptor Line. Ask them to consider alternative routes for the wastewater line. Click here to review the city’s planning documents and see more visuals.